The Arms of a Woman Courageous shooters hold their own with the ultimate equalizers on the American frontier. Annie Oakley and Calamity Jane were some of the most popular armed women of the West, but they were not the only shooters of note. 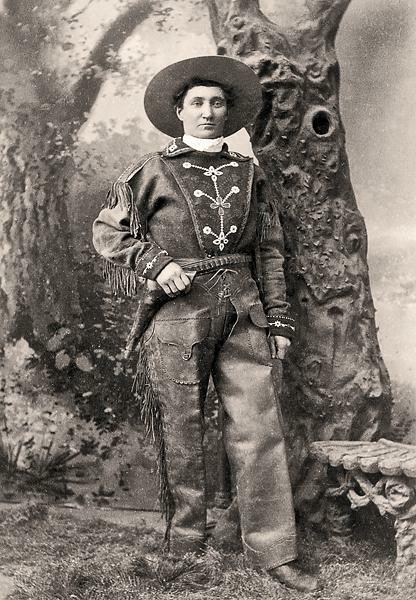 Homesteader’s wives such as Elinore Stewart carried a Winchester, ranchers such as Frances Mullin carried a Colt Single Action, hunters and trappers such as Gertrude Raines used a carbine and lady gamblers such as Eleanora Dumont used Remington double derringers. 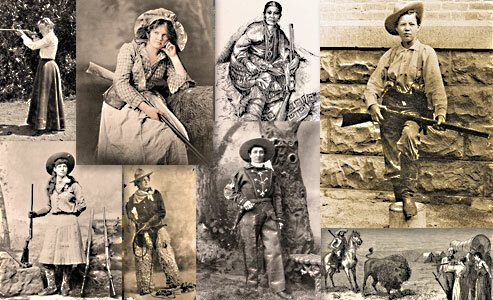 Armed women on the frontier were not uncommon. It was important to be able to defend oneself and one’s family and, if necessary, to signal for help or dispatch incapacitated livestock. Courageous defines the character of the thousands of women who left the town and cities of the East for the unknown dangers of the Western territories. Setting up housekeeping in wild, unsettled lands, risking their lives on the journey and bearing children under primitive conditions tested their mettle daily. Many faced these rugged circumstances carrying a firearm. 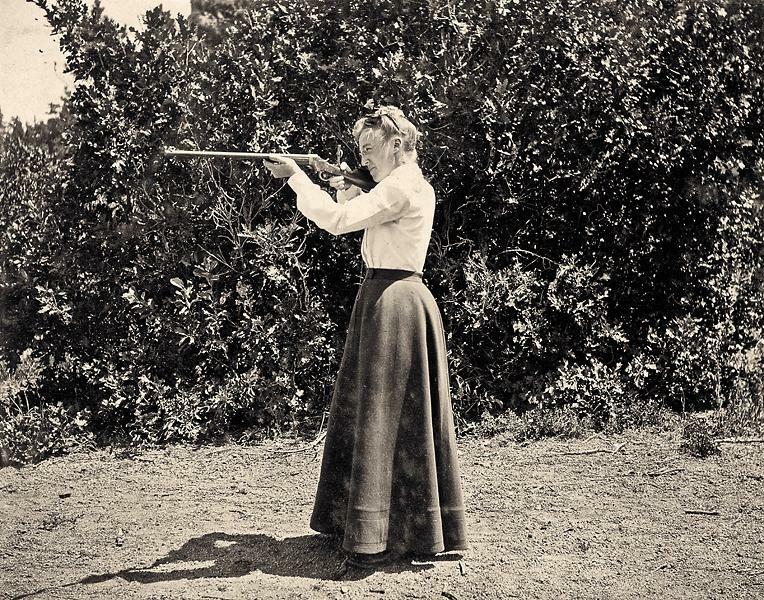 For many armed ladies on the American frontier, owning a gun and knowing how to use it was not only a point of pride, but also a great equalizer. Shared here are a few of their stories. Chris Enss is a New York Times best-selling author who has written more than 20 books on the subject of women in the Old West. Her most recent title is Love Lessons from the Old West: Wisdom from Wild Women. 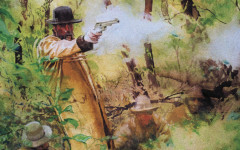 Armed mothers, sisters and wives kept their families safe from wild animals, hostile Indians and ruthless highwaymen determined to harm their loved ones. No record of the settling of the West would be complete without the mention of the dedicated women homesteaders who stood between a successful life on the plains and anything threatening to interfere with their livelihood. 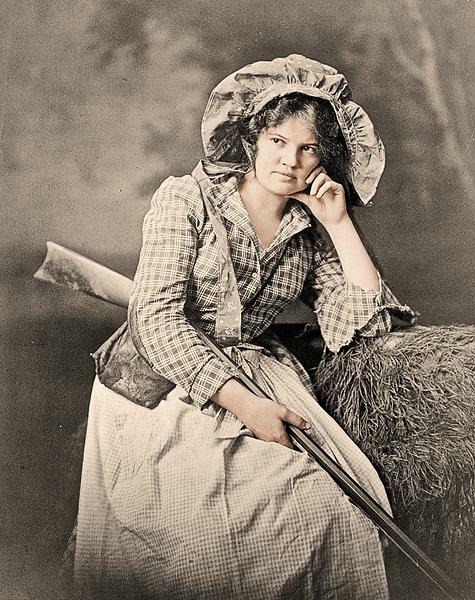 The 1901 portrait of an unidentified young woman, holding a muzzleloading, half-stock plains rifle, represents the lengths a woman would go to protect everything she held dear. 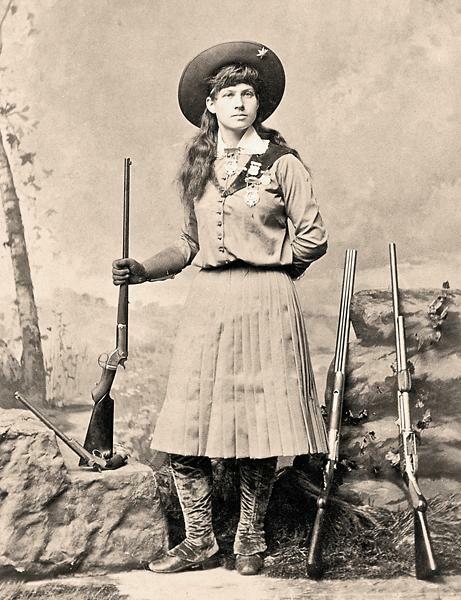 Annie Oakley, who earned worldwide notoriety for her shootist skills while touring with Buffalo Bill’s Wild West, holds a Stevens tip-up target rifle and displays three of her arena guns—a double-barreled shotgun, a Spencer slide-action shotgun and a long-barreled Stevens pistol—in this circa 1886 cabinet card. 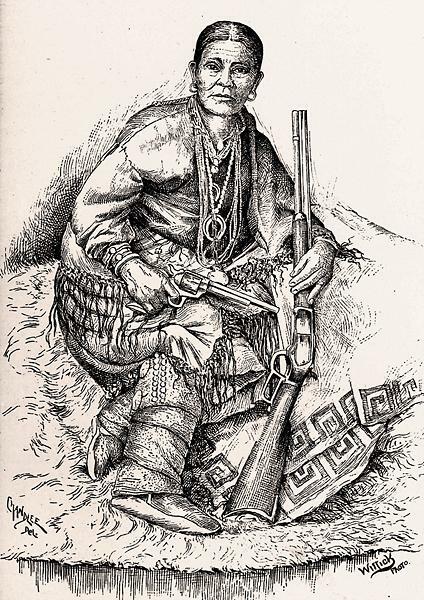 Already subdued on the reservation by the time of this illustration, given the 1873 Winchester this Navajo woman holds, along with her Colt Single Action Peacemaker, the Navajo also models naja pendants. Other world cultures have worn najas to protect the wearer from the “evil eye,” yet Navajos usually wore the inverted crescents for decorative reasons. No self-respecting stagecoach robber would be caught without the right firearm for the job. Here, lady bandit Pearl Hart poses with a Winchester Model 1873, a Colt Single Action and a Model 1877 Lightning. 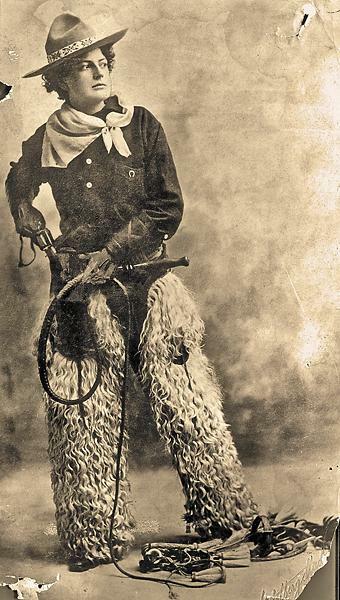 Nothing goes better with a pair of woolly chaps and a bullwhip than a six-shooter. Exhibition or trick shooters, like the sharp dressed woman in the studio photo, performed for audiences throughout the West, wowing fans by shooting aerial targets and dimes tossed in the air. Colt’s New Army and Navy double-action revolvers were a favorite for professional shooters with considerable skill. Emigrant wagon trains carried “about one ‘gun’ to a wagon, those being mostly Western rifles, some few being shotguns,” an observer in 1856 Kansas noted. 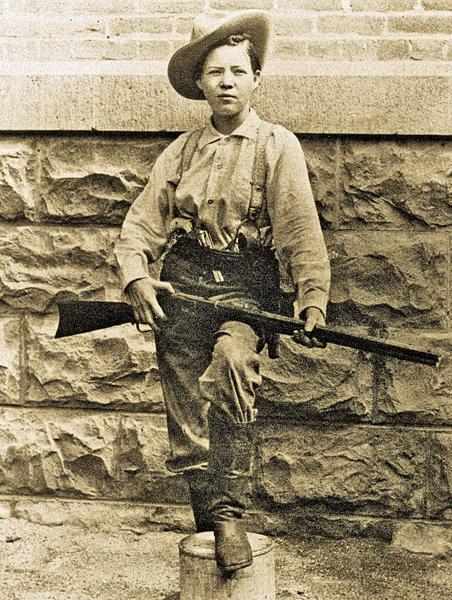 Since a frontier woman might be called on to help defend those around her, learning how to handle weapons was in her best interest; this pioneer, serious about her marksmanship, is testing her proficiency with a Stevens Ideal Ladies Model rifle. Ladies on the trail to the West traded in their petticoats for rifles and learned to shoot game needed to sustain themselves and their families. 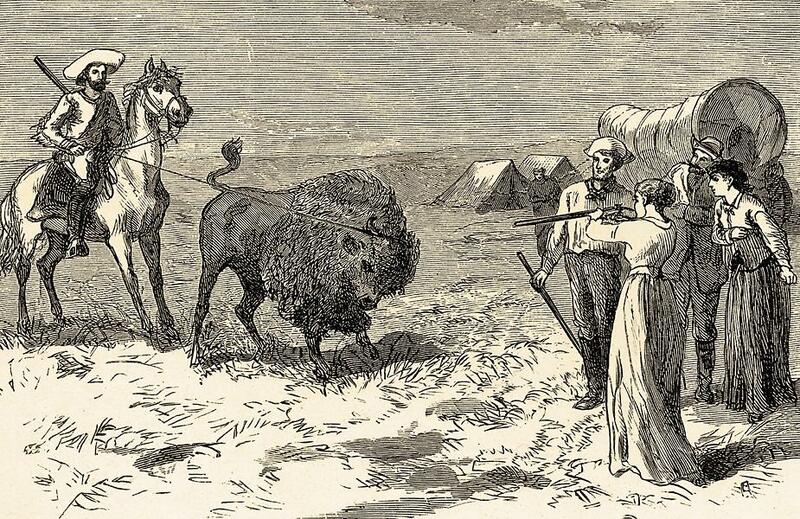 In this romanticized illustration, this pioneer has cut a single buffalo out of a large drove so she can sell it. The hindquarters of a buffalo, weighing from 75 to 100 pounds, sold for $2.50! Sharps’s Model 1874 rifles were one of the most popular guns used to hunt American bison to near extinction in the late 19th century. 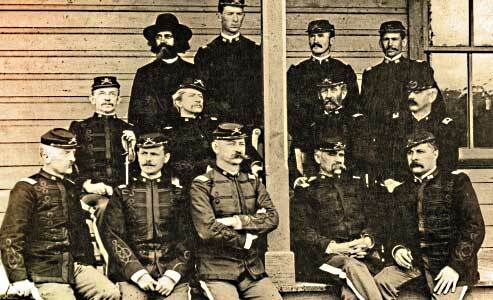 Soldiers of the Cross The first Buffalo Soldier chaplain lights the path for others, despite a dishonorable discharge. Was Geronimo a Terrorist? 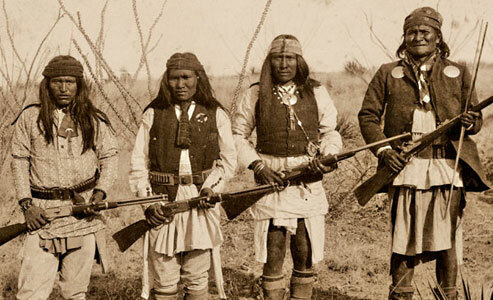 Tracing America’s view of the Apache warrior from bloodthirsty terrorist to patriot chief. This is Where Cole Younger Dies The incredible true story of how the leader of the Younger Boys cheated death and taught a nation patriotism.